Agilent Technologies Inc. (NYSE: A) recently introduced a new compact tunable laser module for its 816x Series lightwave measurement platform. In addition, the company introduced a fast spectral loss engine, a new software package for the N7700A photonic application suite. The new module and software help boost test throughput in optical component manufacturing by achieving a measurement repetition rate that is unparalleled for solutions in this class. The Agilent 81960A compact tunable laser sets a new mark in tunable laser performance with 200 nm/s sweep speed and increased acceleration, combined with the dynamic accuracy specifications needed for measuring dense-wavelength division multiplexing (DWDM) components, all packaged in a compact module. The new and unique capability of dynamically specified sweeps in both directions enhances the repetition rate to 2 Hz for real-time use in adjustment and calibration procedures. The 81960A compact tunable laser is designed for making spectral measurements of passive fiber-optic components, where engineers need results with high wavelength accuracy and dynamic range. Engineers can take full advantage of the laser's swept-wavelength measurements by using the N7700A software suite. The laser's high performance in continuous sweeps complements the N7700A-100 single-sweep polarization-dependent loss and insertion loss measurement engine. The dynamic wavelength accuracy will satisfy the test needs for many DWDM components. The 81960A's speed is best harnessed with the new N7700A-102 fast spectral loss engine, which synchronizes the laser with N7744A or N7745A power meters to produce power and loss spectra in a convenient graphical display. The wavelength resolution and 50- to 60-dB dynamic range surpass comparable measurements by an optical spectrum analyzer, with repetition rates better than 2 Hz for filter component adjustment and calibration. When used with the N7788B component analyzer, the new laser delivers greater speed and accuracy for measuring polarization mode dispersion and differential group delay in addition to polarization-dependent loss and insertion loss. The relative wavelength accuracy during the sweeps is especially important for accurate differential group delay measurements using the Jones-Mueller-Eigenanalysis (JME) method, since the result depends on the derivatives with respect to wavelength. The high speed is great for measuring isolators, polarization-maintaining fiber and other broadband components. 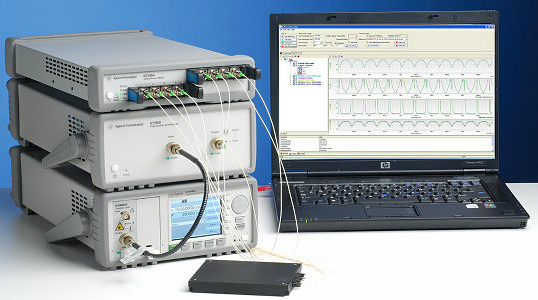 "Manufacturers of DWDM components operate in a challenging competitive environment where they need to continuously strive for higher test throughput and better yield," said Jürgen Beck, general manager of Agilent's digital photonic test product line. "With the combination of the 81960A compact tunable laser and the new fast spectral loss engine, we help improve our customers' asset productivity. The solution's test speed, a very competitive price/performance balance, and its compact format will certainly attract customers in manufacturing, engineering and research." Accurate spectral measurements during continuous sweeps with dynamic wavelength and power specifications. C- and L-band wavelength coverage for DWDM component measurements. Fast repetition rates for device calibration and tuning with up to 200 nm/s sweep speed, bidirectional sweeping and 1-3 Hz repetition rate, depending on range. Up to +14 dBm output power, adjustable down to +6dBm. Automated measurements supported by N7700A measurement engines, updated 816x plug-and-play driver, N4150A photonic foundation library and direct SCPI commands. Graphical user interface for convenient power and insertion loss measurements. Customized automation using the COM interface for the engines. Additional information about Agilent's new tunable lasers is available at www.agilent.com/find/tls. High-resolution images are available at www.agilent.com/find/tls_images. Additional information about Agilent's N7700A photonic application suite can be found at www.agilent.com/find/n7700. A backgrounder on optical component test technology and Agilent's solutions is available at www.agilent.com/find/oct_backgrounder. The Agilent 81960A tunable laser will be available for ordering starting Oct. 15. List prices start at $47,000. The Agilent N7700A-102 fast-sweep insertion loss measurement engine also will be available for ordering Oct.15. List prices start at $1,100. A 30-day trial version will be available online..